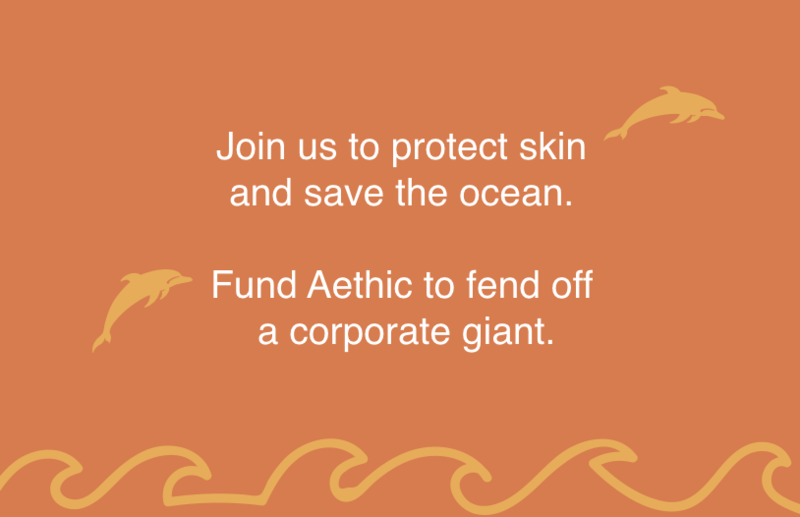 I am the founder of independent skincare company Aethic and co-founder of The Going Blue Foundation which works to diminish aquatic pollution and fund reparative projects in the ocean. 100 committed people backed this campaign. The "Aethic 100" are our hard-core of super-backers and form the nucleus of a movement that we'd like to grow! Suncreens are big business, but sadly many of those found on the high street do not protect skin adequately and just as many also seriously damage marine life. Aethic Sôvée overcomes both these challenges. Scientific testing was conducted by skin experts and marine scientists who are leaders in their fields and the resulting data was used for a patent application which the European Patent Office approved. It is the world's first and only patented ecocompatible sunscreen formula. But, giant Nivea-owner Beiersdorf is trying to bring down our small independent company by lodging an opposition which attempts to cancel our patent. It's a typical case of David v. Goliath! Why would they try to do this? Probably because we've been 'disruptive' and however small we still are, pose an early threat to their enormous worldwide business with our excellent skin-protective quality and unparalleled ecological credentials. Our Patent Attorney Paolo di Giovine explained: "At the European Patent Office, they have to look into every opposition lodged, even if it is withdrawn and irrespective of its merits". If we do nothing, their opposition will go unchallenged and our unique product may be wiped out. When we win, we continue to protect skin and save the ocean - like no other company does. So we need your support to fend off this skincare giant and protect our patent, fast. Without shark squalene, parabens, oxybenzone or petroleum-based emollients, Sôvée has three sun filters, three natural moisturising oils, Vitamin E and food grade preservatives. It is broad spectrum, very photo-stable and this scientifically-proven and peer-verified patented formula leaves marine life intact. Our box is glue-less, our paper is sustainable, our inks water-soluble and food grade, the bottle is made from Green PE derived from sugar cane and our transparent film is compostable. The product is certified marine positive and for every bottle we sell, we contribute to the Going Blue Foundation for its work to diminish water pollution and restore marine habitats like coral. At Aethic we stand firm by our patent and are vigorously going to defend it at the European Patent Office. As this defence will prove very costly in terms of legal fees, we really need your help. Just imagine, you will have had played an important role in seeing off Beiersdorf’s evil attack and will have defended Aethic; a company with people like you which is doing everything possible to protect skin and save the ocean. Support us and Fund Aethic to Fend Off Beiersdorf. Please contribute now. Who already uses and endorses Sôvée? Sôvée has been selected as the official sunscreen by teams of people taking part in the America’s Cup, Volvo Ocean Race and Vendée Globe sailing competitions and is used by champion kite-boarders plus the New Zealand surfing team. It has partnered with Blue Flag, The Coral Triangle, Mr & Mrs Smith, Quintessentially and National Geographic and been shortlisted by the Beauty Shortlist. First launched in Selfridges it is sold online and through retailers like Planet Organic, Helly Hansen, Whole Foods, A.S. Cooper & Sons, luxury resort hotel boutiques and other select stores around the world. Best of luck in court! Just amazing -> we're on the home straight, 275 shares and 62 backers so far! Now, if more 'sharers' can also 'back' :-) We need an average of £150 a day to get us past the post. Remember, if we don't reach £6,500, we get nothing... Thank you for you support, please back us now. Just a few £ short of the half way station!!! You can help by emailing your friends, sharing this link on Facebook and Twitter. Please act now and keep our patent afloat.